Zoua: "Bundesliga's the strongest league in the world"
Hamburg - Only a week after joining up with his new teammates, Jacques Zoua was lucky enough to lift his first piece of silverware, clinching the Nordcup mini-tournament after Hamburger SV overcame Danish side FC Kobenhavn and Bundesliga rivals Eintracht Braunschweig. 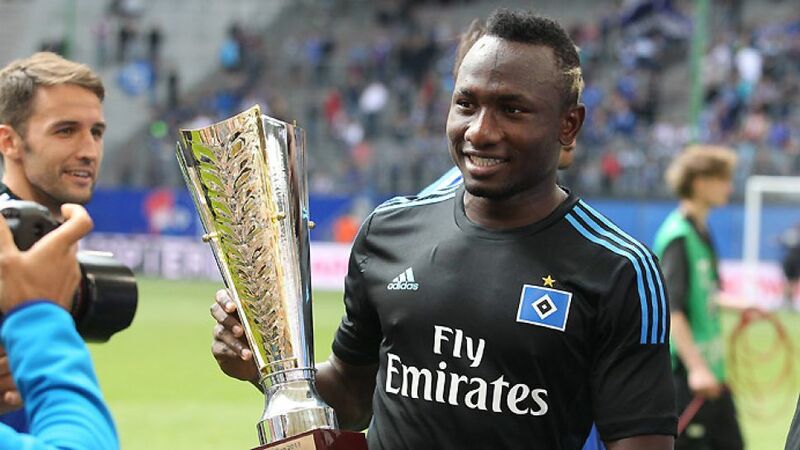 Speaking to bundesliga.com, the 21-year-old Cameroon international, delighted with his new surroundings, explained the reasons behind his move from Swiss champions FC Basel to join German top flight ever-presents HSV. bundesliga.com: Jacques Zoua, snatching a title in your first tournament with Hamburg isn't the worst of starts. Jacques Zoua: Absolutely, it's always great to win trophies. We might have only beaten Braunschweig on penalties in the first game, but I believe we have good reason to be very happy with our performances. Positive results in pre-season also help the atmosphere in the camp. bundesliga.com: How was the first week with your new teammates? Zoua: The team has impressed me very much. HSV have great footballers, and their attitude is good too. I have no doubt about us having a successful future ahead of us if we stick to the good work we did in our training camp. bundesliga.com: Do you feel you've reached your best fitness level yet? Zoua: I only picked up team training about a week ago, so there's I've still got a ways to go. However, I'm certainly heading in the right direction. bundesliga.com: What are your strengths on the pitch? Zoua: Despite having many qualities, I know there's still room for improvement. I just hope to get better with each training, every day. bundesliga.com: Is it an advantage for you to have previously trained under head coach Thorsten Fink at Basel? Zoua: It is, and I enjoy the way Thorsten Fink leads a team. He knows how to treat the players, and that goes for all types of characters. bundesliga.com: What are your impressions of the Bundesliga? Zoua: The Bundesliga is the strongest league in the world at the moment. Two German clubs reached the UEFA Champions League final last season, and FC Bayern of course won it - I don't think there's a better explanation. I've already had great experiences playing in both the UEFA Europa League and the UEFA Champions League with FC Basel, and now I'm making the next step. I'm glad that a club of Hamburger SV's incredible stature have presented me with this opportunity. bundesliga.com: Are there particular players you look to forward to playing against? Zoua: I'm very keen on meeting the big sides, FC Bayern in particular. Ribery, Schweinsteiger, Robben - they have nothing but big names in their side. For a young player like me, it's of course fantastic to able to play against them. bundesliga.com: Which targets have you set yourself for your first year at Hamburg? Zoua: I hope to score many goals, as this is the reason I was signed. I want to give my all for the team when on the pitch so that we can achieve our targets.